There will be two social events at Measuring Behavior 2016. The welcome reception will be in the Guinness Storehouse and the conference banquet will be at Clontarf Castle. The Guinness Storehouse is Ireland’s most popular tourist attraction and was recently named as Europe’s best tourist attraction. The welcome reception opens at 7:30pm. Venue closes at 11pm. 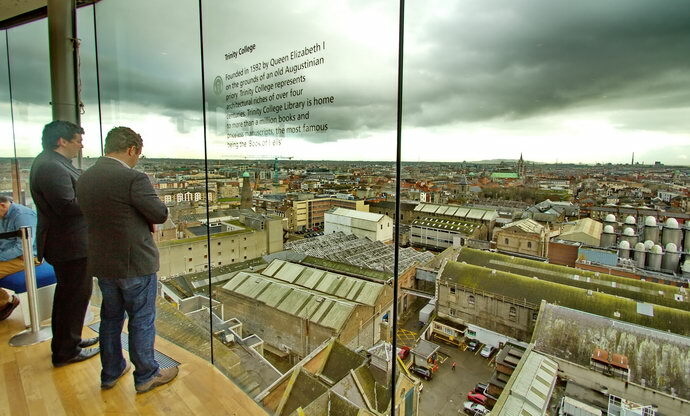 The Guinness Storehouse is a short walk from the Radisson Hotel. We will provide a map in your delegate pack. The welcome reception is informal, so you are free to come when you wish and leave when you wish. Please stay for some time to enjoy the spectacular venue. Informal food will be served from 8pm, and will consist of cold food bowls, hot food bowls and desert bowls (vegetarian bowls are included). Drinks vouchers will be provided (for Guinness, wine or soft drinks) and there will also be a cash bar. The Guinness storehouse shop and visitor centre will remain open from 7:30pm to 8:30pm for all attendees. Clontarf Castle, dating to 1837 is built in an area famous as a key location of the Battle of Clontarf in 1014. There has been a castle on the site since 1172. It is about 5 kms from the city centre, so busses will leave Radisson at 6:30 and 6:45pm. Busses return to the Radisson at 10pm and 10:30pm. There will be a three-course meal served, with starters (choice of smoked salmon or potato & leek soup), main course (choice of beef or sea bass) and desert (Baileys & Chocolate Bomb) with tea/coffee. Red and white wine will be served and soft drinks are available on request. For those who wish to indulge in other local drinks, there will also be a cash-bar open and any delegate is welcome to retire to the historical Clontarf Castle hotel after dinner. Please note that the last bus will leave at 10:30pm. If a delegate misses that bus, the city centre is a short taxi-ride away.